Crouse-Hinds Condulet® EAJT Series Explosionproof conduit outlet box in electro galvanized finish, has Feraloy® iron or aluminum construction for added strength and durability. It has hub size of 3/4-Inch and location of bottom, right and left. 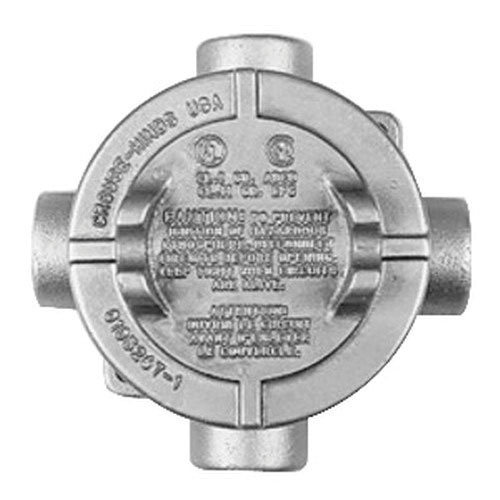 This conduit outlet box with 3-3/16-Inch Dia, has external threads on body to protect conductor during pulling. Outlet box features smooth internal bushing to protect conductor insulation during pulling. It provides access to conductors for easy maintenance and future system changes and acts as mounting outlets for fixtures. It is suitable to change conduit directions. This outlet box includes copper-free aluminum cover. The conduit outlet box meets UL 1203, CSA C22.2 No. 30, NEC/CEC: Class I, Divisions 1 & 2, Groups AA, B, C, D; Class II, Division 1, Groups E, F, G; Class II, Division 2, Groups F, G; Class III standards.